What to Look for When Buying Large Breed Puppy Food? How Much to Feed a Large Puppy? How Often to Feed a Large Puppy? When to Switch Your Dog from Puppy Food to Adult Food? 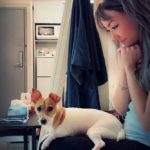 Here is a general timeline for your pup’s first year! Some breeds with special traits and unique characteristics need different kinds of food. The best way to give your pup the best foundation to grow into big and healthy adults is to pave the way when they are young. For large breed pups, they are prone to elbow and hip dysplasia, and certain orthopedic diseases. If you feed your large baby food that is specifically engineered for their unique needs, you can significantly decrease the risk of these diseases and more. Large breeds, such as Great Danes and St. Bernards, have different nutritional needs than small and medium breeds. Finding the right food that’s also tasty can be a really daunting task. But don’t worry, as always, we’re here to help! Everything starts with food. You want your dog to live a long and healthy life, and this can put a lot of pressure on you to find the best food for large breeds. Every choice available will claim to be the best. We’ll break down each choice and show you what to look for next time you venture down the puppy food aisle. Protein is so important when it comes to diet. The main ingredient of dog food is protein. The protein choice for this large breed puppy food is real chicken. What helps with joint maintenance is glucosamine. This chemical helps support their developing joints and cartilage. DHA, which a lot of puppy foods also have helped with cognitive development. The ingredients in this dog food are chosen for specific nutritional and functional purposes. You can be sure your large baby will be getting the best, and a sufficient amount of nutrition. An added touch of antioxidants helps support his or her developing immune system as well. Why We Like It – With the above-average protein and below-average fat content, this large breed puppy food will make sure your canine will grow to be strong, without the improper weight gain. This option is so in demand they are constantly out of stock! It is tailor-made for large breeds from 50-100 lbs at full size. The special blend of minerals, promote healthy bone and joint growth. The antioxidants and vitamins support the immune system in perfectly sized kibble designed for large puppies to chew. It’s important for the puppy food to be easily digestible, and have prebiotics to help their digestive system much like this brand has. Grain-free, all-natural and holistic, this large puppy food won’t be hard on your pup’s stomach and digestive system. 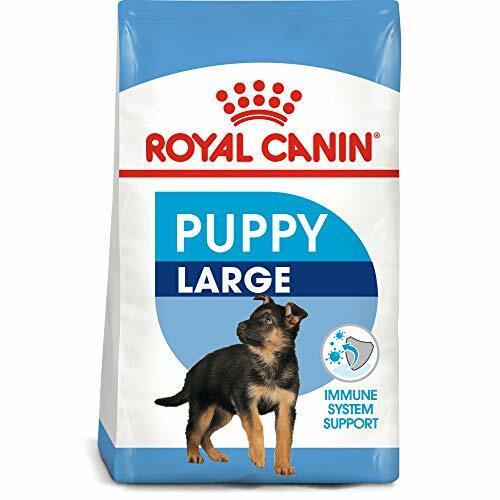 Why We Like It – Royal Canin has the right sized diet made precisely for larger pups. With optimum amounts of nutrients, your pup will develop strong muscles and bones that will support their large bodies. Clinically proven, Eukanuba has DHA levels derived from natural fish oil to help with brain and eye development. Your large pooch will become smarter and more trainable with daily intake. 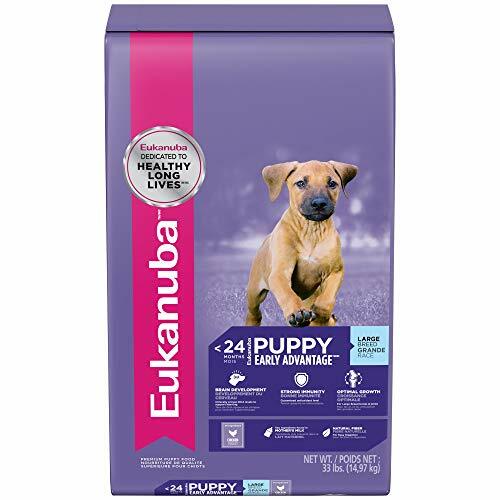 For digestion and nutrient absorption, Eukanuba utilizes natural beet pulp and prebiotics. To maintain a healthy coat and radiant skin, optimal levels of omega-6 and 3 fatty acids are added. With the guaranteed levels of proteins and calcium, your large puppy will grow to be healthy and strong in no time! The satisfying taste of real chicken is something your dog will love. Give your large pup the proper nutrition it needs. Purina ONE uses real chicken as the protein, so take comfort in knowing that you’re giving your pup the best. Easy on the stomach, easily digestible nutrition with rice is included. With two textures, the tender morsels and crunchy kibble will surely be irresistible to your dog. Joint issues are a common symptom seen in large breeds, the glucosamine levels will lower the risk of hip and elbow dysplasia. As for the muscles, the high protein content will help with that, as well as the heart. Why We Liked It – Some larger breeds grow quite rapidly. 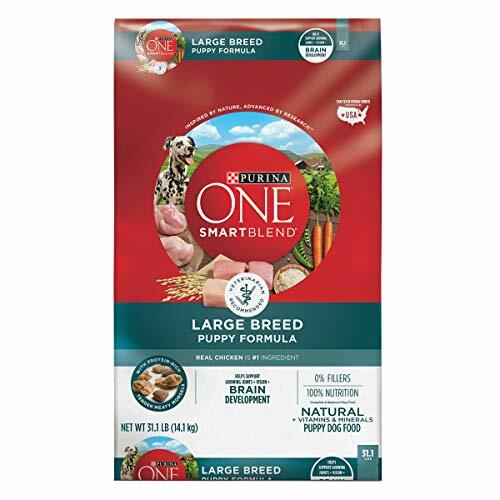 Feeding Purina One to your large breed pup will guarantee full support during the development stage. With not only chicken, but this brand of diet-friendly dog food also has oats as the other main ingredient. 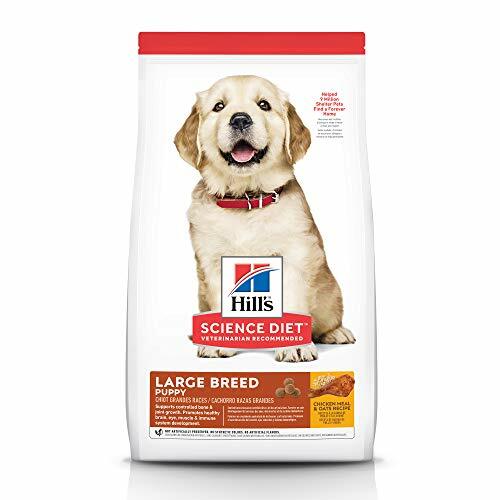 Hill’s Science Diet will support your puppy up to 1 year old. It contains optimal levels of calcium, glucosamine, and chondroitin used to support bone growth and strengthening muscles and joints. Vitamins A, C, and E support a healthy immune system along with antioxidants. To be the perfect blend for your dog, absolutely no artificial colors, flavors or preservatives are added, to produce an easy to digest formula with sufficient vitamins, minerals, and amino acids. Tell your pup to get ready for a tasty and nutritious meal! Why We Like It – Made in the USA with ingredients sourced from trusted international sources, Hill’s Science Diet makes sure the suppliers meet stringent quality standards. 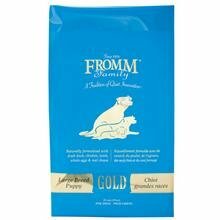 Fromm guarantees that only the highest quality ingredients are used in their large puppy dog foods. Being a family owned and run company, Fromm is able to pay extra attention to what’s best for customers. This large breed puppy food is easy to digest and will help with their stool. Formulated with fresh protein such as duck and chicken, you know your pup will be getting the best. The Fromm brand comes highly recommended by breeders and trainers. 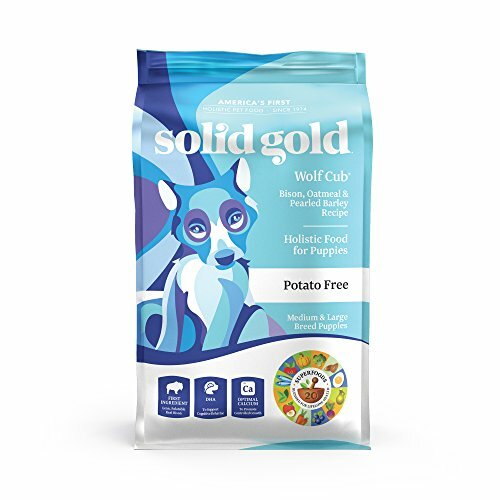 Packed with all the protein and vitamins as well as minerals a large breed dog may need, you know you are making the right choice with this food for large pups. Why We Like It – Fromm provides a very balanced amount of protein, fat, and carbs in this formula. Created for larger breeds, this is a food that will fuel your big pup every day. Wholesome and essential, Nutro is true to its name. With non-GMO ingredients and farm-raised chicken as its protein source, they deliver a great taste that helps to support muscles. There are no artificial preservatives, flavors or colors to be found in this formula. What you will find are omega 3 fatty acids, calcium, and different vitamins. This is your pup’s version of healthy and clean eating. Eating healthy does not need to taste bland, with chicken and lamb flavors to choose from, this is great for even the pickiest of eaters. Why We Like It – If you decide to take a look at the ingredients list, you won’t see anything you don’t recognize or that’s not clearly labeled. This gives you a sense of security, knowing you know exactly what your large pup is consuming. 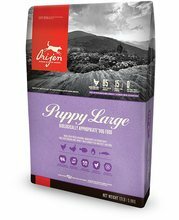 Bursting with flavor and nutrients, Orijen’s goal is to provide your large pup with protein and other ingredients Mother Nature intended. Each bag contains free-range chicken and turkey as the main proteins, whole eggs, and wild fish. Large pups need more muscle mass, and this formula is made specifically for that, yet limits the number of calories to promote a healthy weight. If your pup grows to be a healthy weight, this will, in turn, take pressure off their joints and bones, reducing related health issues. No preservatives are involved in keeping the ingredients fresh, all of them are sustainably farmed and arrive fresh or raw each day. Why We Like It – Oftentimes we fear a large pup receiving a lot of nutrients from their food could overeat or eventually be overweight. The ratio is appropriately proportioned to minimize this issue. This brand works hard to produce the perfect balance and ratio of protein, calories and fat to fuel your pup. In addition to lamb and rice for protein, this large pup food also offers phosphorus and calcium. These two minerals are used for bone and joint development. Aside from the commonly found DHA, the L-carnitine helps your pup convert fat into energy, decreasing the chances of being overweight. 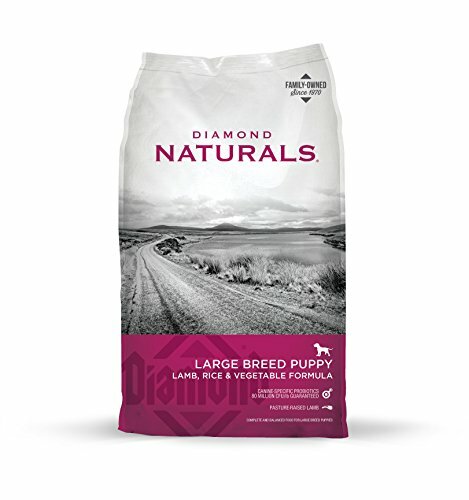 Trust that Diamond Naturals has the best intention for your pup with trusted ingredients. Absolutely no corn, wheat, fillers or artificial content will be found in each bag. Why We Like It – Each formula is enhanced with superfoods to provide complete and holistic nutrition for your large breed puppy. The L-carnitine will help regulate your pup’s body fat by converting it into energy. Made to support the development of puppies from 1 to 12 months with farm-raised chicken as the number 1 source of protein. If grains need to be included, make sure they are whole grains like those found in Nutro to help with digestion. Made in the USA in their own facility, safety is a number one concern for Nutro. 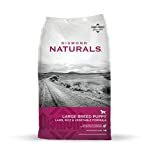 This food for large puppies is all natural and contains no artificial flavors or preservatives. Not to mention the affordable price, you won’t find any harmful products like protein by-products, corn, wheat or soy. Give your large pup the support it needs to grow! Why We Like It – The high amounts of EPA’s aid your pup’s immune system. Coupled with high levels of DHA which aids cognitive development, your big baby will be the smartest around! 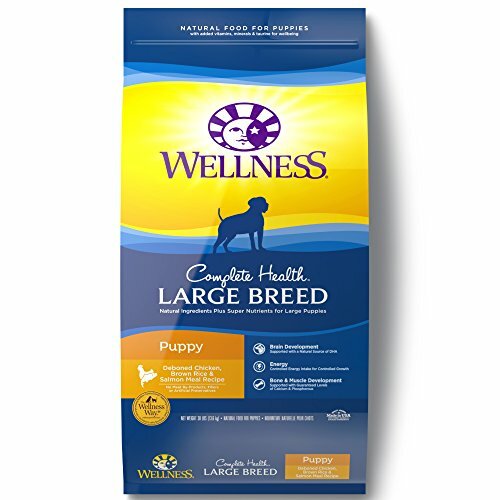 This brand will really make your pup’s health complete by taking care of their overall health. Because large dogs obviously have larger mouths, the larger kibble size will make it easier for your dog to chew. Wellness only uses all natural ingredients with no wheat, corn, soy or meat by-products. Made in the USA with DHA for healthy bone, brain and eye development. You may mix this dry kibble with their wet dog food for extra texture or an extra treat for your pup. Why We Like It – Wellness provides overall support for the most important foundation year of your pup’s life. If you start early, the difference will be immense when they grow into adult canines. 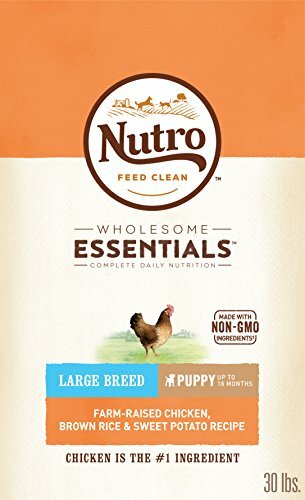 Nutro sure makes a lot of food for large breeds. This one contains a trio of proteins from chicken, lamb, and salmon. Each bowl will be a balanced proportion, serving your dog with the necessary nutrition it needs every day. 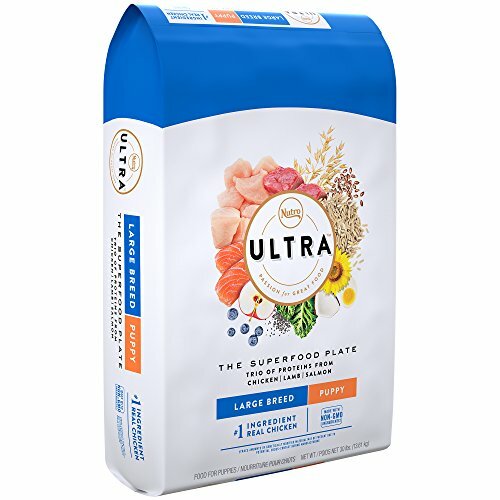 Other than the protein, Nutro supplements the blend with superfoods like coconut, chia, kale, blueberries, and others. Just from these alone, your large breed pup will be getting the vitamins and antioxidants it needs for a healthy immune system. Why We Like It – After your pup’s first birthday, feel free to switch to the adult type of kibble for your pup. Nutro formulates recipes to meet your dog’s needs at every stage in life. Not with the usual chicken as the protein source, Solid Gold uses bison meat! That will surely make your large pup big and strong! Everything is balanced for your pup to have controlled growth. The natural bison meat will be a new and enticing flavor for your dog. Also supplemented with superfoods, you won’t find any fillers in this all-natural allergy-free formula. 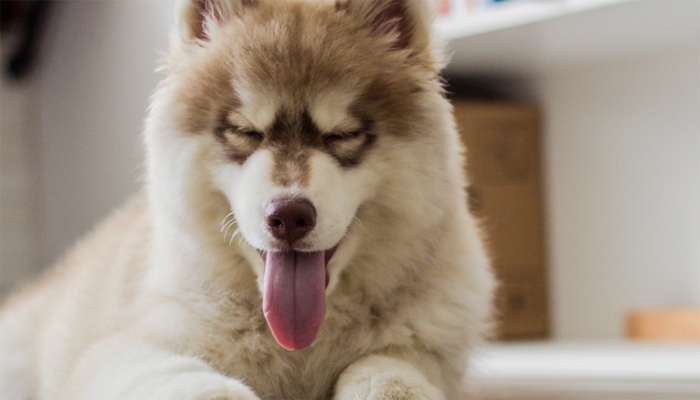 For digestion, fiber-rich probiotics will give your pup a healthy gut. 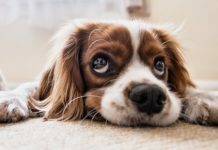 Why We Like It – You do not want your big pup to grow too fast, other than being cute when they are small, growing too fast could be harmful to their bones. The balanced formula promotes controlled growth so this won’t happen. Large pups have big needs. 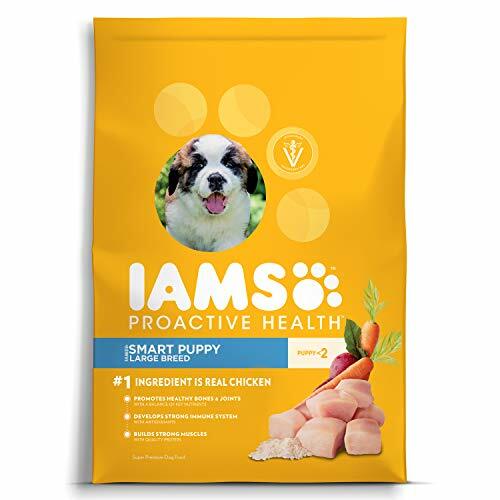 Ingredients that include pre and probiotics, natural fibers and digestive enzymes and botanicals are important and they can all be found in this brand of large puppy food. Larger babies mean larger kibble with real lamb as the protein source. You won’t find any by-products, wheat, or artificial content in this mix. 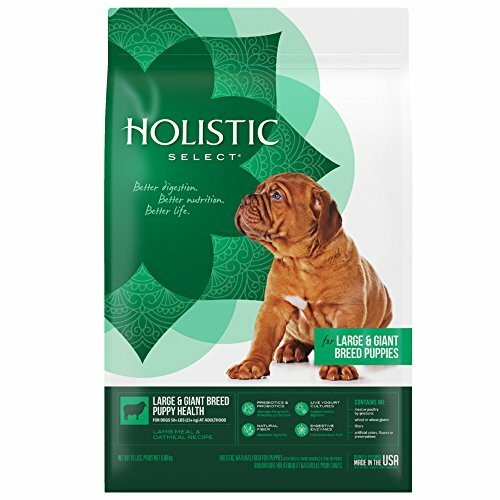 Made in the USA, rest assured Holistic Select aims to give your dog the best. 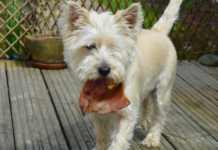 Why We Like It – They key to your dog’s health is through their stomach. Watch what they consume and give them the best with Holistic Select. 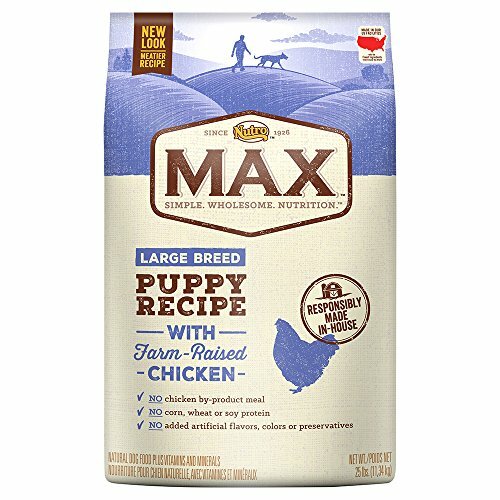 Another chicken blend, this is a vet recommended large puppy food. Like many of the ones above, real farm-raised chicken is the #1 ingredient. Aside from this, Iams includes 22 ingredients that are typically found in a dog mom’s milk. 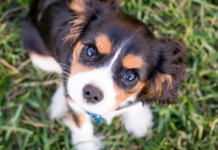 The omega-3 and DHA ingredients support cognitive functions for smart puppies. Get all-around support with Iams, and you can be sure your pup will get everything it needs. Why We Like It – Tailored for large dogs, it’s most suitable for pups that weigh from 5o to 120 lbs as adults. Healthy skin, bones, immune system and coat, Iams has the best for you. If you are parenting a large breed puppy, making sure they are getting proper nutrients is one of the most important, if not the most important part of your job. The health and happiness of your big pooch depend on it. 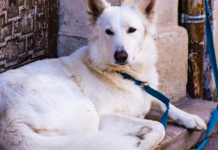 Growing up with health deficiencies would be tough on your pooch and on your heart. Big dogs have different needs than their smaller counterparts. 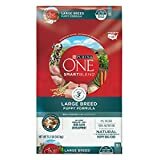 Let’s try and find the best large pup dog food for your pooch. Large breeds have a very common disposition. Bone and joint issues are what they suffer from. The best puppy food for large breeds has lower fat content, vitamin D, calcium and phosphorous to help with these issues. It’s important for your large pup to not grow too fast. Growing too fast puts extra strain on their joints and bones. Not only do they face hip dysplasia, and elbow dysplasia as mentioned above, they also battle other issues such as osteochondrosis, developmental orthopedic disease, digestive issues, as well as obesity. Unfortunately, large breed pups are genetically prone to these diseases, but overfeeding and too much calcium are also major contributing factors. As if they weren’t big enough, overfeeding them could cause them to be even larger in size. 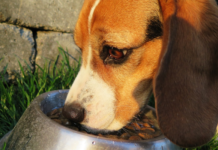 To gain control over this problem, make sure you measure your pup’s food and give them the proper portion. It’s not so much the amount, but what’s inside, because each brand of large puppy food measures the ingredients impeccably to meet our fur baby’s needs. If we give them too much nutrition, our overweight babies will be at risk of heart disease and shortened life spans. Control their diet and make sure they get plenty of exercises. Steady consistency will ensure your large breed pup will maintain their health through to old age. We all associate calcium with bone reinforcement. However, too much of something is never a good thing. Everything in moderation, right? Having too much calcium in their diet will result in bone and skeletal issues for your dog. Puppies are the ones that suffer from this the most. This is because they are unable to control how much their intestines absorb, which will lead to overgrowth. Controlling their intake is important throughout their lifetime, but most of all during their first developmental year. Gastric Dilation-Volvulus, the scientific name for bloating, is seen in Bulldogs and also large breeds. This happens when too much gas is stored in their stomach. If this condition is allowed to fester, many poor pups might not make it. So instead of allowing this situation to begin, we need to prevent it from even happening. Here are some tips on how to prevent bloating. Feeding your pup smaller meals throughout the day. Make sure their bowl is ground level and not raised, so they take in less air when feeding. Avoid high-fat content in their food. Most large breed dog foods will have larger kibble, which slows down their feeding. Make sure they have enough time to fully digest their food before exercising after each meal. Dry food is most often better than wet food. It is more cost effective and also healthier for your larger pup. Dry food is widely available and easier to measure to prevent overeating. Dry food can keep for longer periods of time and is also beneficial to your dog’s oral hygiene by cleaning their teeth. Do not cut corners when it comes to food for your pup. We can understand cutting corners on things like diaper pads and the occasional outfit on sale. But when it comes to food, this is something we cannot skimp on. Your dog’s health will outweigh any cost. Buying quality food for your large pooch can be expensive, but it saves money in the long run. How? Imagine all the vet bills you’re saving on by monitoring their food intake from the get-go! Quality brands are more expensive for a reason. They use human grade ingredients with proper nutritional content and no fillers. You get what you pay for. Now you know the most common health issues your large pup may have. In the next part, we’re going to take you through the important ingredients to look for and which ones to steer clear of. As you have seen from above, protein is the main ingredient for dog food. This is especially necessary for larger breeds. If the label on the food you have now doesn’t have protein as the main ingredient, it’s time to rethink your purchase. Good examples of protein include chicken, salmon, beef, pork, and lamb. Free range, wild caught and grass-fed ones are the best. Some companies substitute meat with grain. Grain is a controversial ingredient. If you must have grain, make sure they are whole grains. While grains aren’t necessarily bad, they won’t provide enough nutrition to support the growth of your large breed baby. Many of our suggestions above also have probiotics and prebiotics. These are healthy and beneficial bacteria that support their digestive system. These are also bacteria we need for a healthy gut. Probiotics are for the digestive system and intestinal function while prebiotics is a kind of dietary fiber that helps the bacteria in their belly. Lots of food for large breed pups contain omega 3 and 6 fatty acids. These fatty acids help with the brain and eyes. Claims have been made that they will make your pet smarter and help with cognitive functions. Aside from that, the external benefits are healthy skin and a glossy coat. Where can you find these great acids? They are most commonly found in fish. The large pup food you choose with salmon as a protein source will have this. If not, your pup can also gain these fatty acids through flaxseeds. Antioxidants keep us young! That applies to us, but for dogs, it promotes healthy overall living. Antioxidants boost their immune system, which is imperative during the puppy stage. Fruits of bright colors and veggies are great sources of this compound. Artificial ingredients are usually added just for pleasure. They make the food look and taste better with no added health benefits. Conversely, they are actually often the cause of allergies and other long-term health problems. If made with good quality ingredients, your dog will love the taste of their food. The color is just to make the food more pleasing to us because your dog will not notice. Everything tastes good to your dog. But if the ingredients are not recognized, then they could contain things such as wood chips! You don’t want to know what they use in meat by-products. But for the sake of your pet’s health, we’re going to tell you. They use rendered parts from the slaughterhouse. Such ‘parts’ include leftovers that include but are not limited to lungs, bone, fatty tissue, brain, intestines etc. Gross! Make sure none of that is in your pup’s food. This option comes in lamb and oatmeal option. This provides double nutrition. Aside from that, they supplement your large pup’s diet with other sources of protein that include chicken and fish. From the fish, you get DHA which is what your large pup needs for brain and eye development. They have a lower percentage of fat and calories to encourage slow growth in giant breeds. Every dog breed has different caloric and nutritional needs. After considering that, each dog also has his or her own unique needs. For a generic and standard guide, read the nutrition label on your pup’s food or talk to a vet for better suggestions. Let us break down some fundamentals for you to keep in mind. You must take into consideration factors such as breed, activity level, individual metabolism, and age when deciding on portion sizes. Since we are talking about large breeds, we’ll look at pups with a mature weight of 70-140 lbs. As your pup gets older the amount of food also needs to be increased. Remember this is per day, so spread out your meals. The more meals and the smaller the amount the better. Remember that this is a general and loose guideline, watch the dog, not the food. add about 100-130 grams to the amount. 70lbs-110lbs add about 60 grams. 140-170lbs add about 130 grams. When your pup gets to a year old, you can either maintain that level or subtract 20 – 60 grams depending on their condition. * There are lots of growth weight charts to refer to online that give you a good estimate of the amount of food. It’s a good idea to weigh the pup, keep a record and refer to breed appropriate charts. First, let’s talk about how to wean your puppy to solid food. Whenever you make any sort of adjustment to your pup’s diet and food, it’s never an overnight job. It’s always a slow and gradual process that should be adjusted based on their individual needs. At about six weeks of age, you should begin introducing your large breed pup by mixing the kibble with a milk substitute, or milk replacer. Milk replacer is a milk substitute made for dogs. Don’t feed a pup cow, goat or infant formula. Your pup should ideally be fed 3-4 times a day. Slowly but surely, reduce the milk replacer day by day, until your pup eventually accepts solid food. This will greatly minimize upsetting his or her stomach. At about eight weeks, your pup should be eating solid meals. Puppies should have smaller and more frequent meals compared to an adult. Experts recommend about 3-4 times a day. Smaller meals are easier for large breed pups to digest, especially since they suffer more from digestive issues. Their energy spikes throughout the day also won’t be so sporadic. For most pups, at around the 6-month mark, pet parents will switch to 2 feedings a day. However, because we are targeting large breed pups, consider sticking to the 3-4 times a day feeding schedule. Puppy food is very high in calories and nutrition because we need to lay a good foundation so our large pups will grow to be the big mean machines they will be. It’s necessary to switch to adult food as your pup approaches maturity. This is even more important and needs to be done with accuracy for large breeds. There is no set age or time for when to switch, it again depends all on the breed and individual pup, but we can give you a general idea. If you’ve read our other articles, you’ll know that small breeds have a more rapid growth rate. Which means they reach maturity faster. Medium breed dogs reach that point at about 12 months to a year and a half. Some large dogs to giant breeds can take up to two years to reach maturity. Consult your vet to determine what’s best for your breed of large pup. Remember, when making the switch to adult food, follow our advice above. It’s a gradual process that should take about 1-2 weeks (two weeks is the better option). 6-12 weeks: Four feedings of nutrient-rich food a day spread out to every 3 hours. Large breeds should be accustomed to dry food at about 8-10 weeks. 3-6 months: Around this time, you can decrease feeding from 4 to 3 times a day. At about 12 weeks, your large pup should be losing the pot-belly roly-poly look. The portion size should continue to be the same until you see a change in their body type. 6-12 months: Other breeds are fed twice daily, your large breed may keep to 3 times a day. At 12, 13 or even 14 months is when larger breeds can switch to adult food. Giant breeds may take up to 2 years. The procedure is the same as if you’re switching brands. Mix the adult food in slowly with the puppy food and slowly increase the adult amount over a period of a week or two. Over 1 year old: Since large breeds mature slower, keep a close eye on your pup from a year to 1.5 years old. Ask your vet when would be the best time to make this transition. After so much information and research, it comes down to the same saying. There is no right or wrong or standard by the book answer. As a large/giant breed pet parent, you need to determine for yourself and your pup what the best food is. It comes down to the breed and their individual needs. Maybe you have an inactive and sedentary baby, then the amount of food you feed him or her should be less. Don’t skimp on the price. Your dog deserves the best. You can actually find some great cheaper dog foods here. Good, high-quality ingredients with better sourcing and formulas researched for your large breed pup will lead to a long and healthy life. We all want our pets around for the long haul, don’t we? When we love someone we love to shower them with love. Some of us express this by giving our pups treats. Especially for large pups for which obesity is an issue, try to limit the amount you give. Nutritious food trumps treat any time of the day. Their calorie intake should come from food, not treats. When a dog is spayed or neutered, their need for energy consumption decreases. If you recently had your large fur baby spayed or neutered, please follow your vet’s directions carefully instead of the feeding charts. To make sure your feeding habits are doing your dog good, you can take your large pooch to the vet to get an evaluation every few weeks. The body conditioning score the vet will give you ranges from 1 for malnourished to 5 for obese. Young puppies need some baby fat, even large breed pups. After the first 8-10 weeks, or when they start eating dry food, they should be at about a 2. If taking your large pet to the vet takes too much time out of your day, then you can estimate his or her score at home. At a 2, the pup is relatively thin. The ribs may be visible and the backbones can generally be seen. There won’t be much fat on their ribs. A visible outline of the waist should also be seen. By about five to six months, your pup should start looking lean. The Association of American Feed Control Officials (AAFCO) sets guidelines for pet food brands to follow. Most brands follow these rules. However, it’s better to be safe than sorry. Check the package label and see if the brand you choose adheres to these guidelines. This will guarantee balanced nutrition.